Disclaimer: I received products from BAND-AID® Brand. All thoughts and opinions expressed in this post are my own. Prize winner’s contact information will be sent to BAND-AID® Brand for prize fulfillment. Summer is in full swing here in New York, and my boys are in full summer action. We’re spending a lot of time outdoors lately, which is fun, but also seems to bring on more boo-boos from falling! My first aid kit at home is always well stocked, especially with Band-Aids of all sizes. This summer, my boys can heal in style with the new Monsters University bandages from Band-Aid. 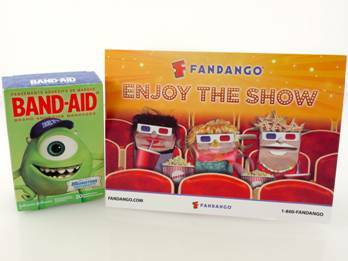 * Band-Aid Brand Adhesive Bandages – this pack includes 20 bandages of two sizes featuring designs from this summer’s blockbuster hit Monsters University. These bandages are really cute, makes having to use them a little easier! They are currently available at Walmart. 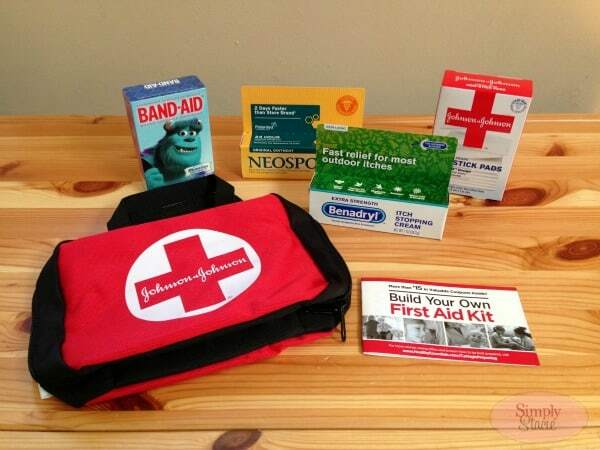 * Neosporin First Aid Antibiotic Ointment – my husband and I have always used this brand, and we continue to use it with our kids. Every time one of us gets a cut we automatically apply a coat of Neosporin. This ointment offers 24-hour infection protection and helps minimize the appearance of scars. We find that it really speeds up the healing process. * Extra Strength Benadryl – this is a must have for any time you’re outside. This itch stopping cream provides fast relief for itches caused by insect bites, poison ivy, sunburn, and minor cuts and scrapes. * Hospital Grade Non-Stick Pads – these pads offer great protection for wounds, as well as helps the wound heal nicely by pulling fluids away from the site. They are also guaranteed not to stick to wounds, which makes removing or changing them all that much easier. The kit also included a coupon book for all of these great products and more. I love that the carry case has dedicated mesh pockets for each of the products – makes it more neat and organized, and easier to use. This case is perfect for traveling and keeping close by for backyard adventures or throwing in the car for road trips. It’s big enough to carry all the essentials, but small enough to fit in a diaper bag. Band-Aid is celebrating the 125th anniversary of the First Aid Kit this year and they are on a mission to remind families of the importance of being prepared for moments of everyday care. You can check out all that Band-Aid has to offer on their website. I like that they have alot of character band-aids that my children would like. I like the quilted-vented pads. I learned that they have Quiltvent technology embedded in the band-aid. I like the Scooby Doo Band Aids! I liked the story about Josephine and her husband. My son would love the Scooby Doo Band Aids! I learned about Band-aids new Quiltvent Technology that wicks blood away to keep wounds clean. I love the Hello Kitty bandages. I learned that dirt and bacteria can actually delay healing of wounds. Band-Aid brand has been used since 1885. I like the single step liquid bandage for those hard to cover places. I like the Band-Aids with plus Antibiotic to help fight against infections. the new quiltvent technology wicks away fluid! awesome! i have always bought bandaid brand bandages… they are the best. I like the Hello Kitty Bandages. I like their Cool for Kids activities for kids section. I love that they have a band-aid for every type of scratch or scrape. they really do have it all covered! They have ones with antibiotic. They now have blister healing bandages! I learned that they now make Band-Aids that wick away fluid! My girls would love the Hello Kitty band-aids. I like the ULTRA-STRIPS Bandages. I learned I need to get new band-aids – LOL – I love the quiltvent – wow – why didn’t someone think of this sooner! I like the HURT-FREE® Antiseptic Wash! I like that the Tough Strips are waterproof. Band-aid provides a resource for all first aid questions. They have new quiltvent technology which whisks away blood from the wound. I learned that they are America’s number 1 bandage brand. I love that you are giving a first aid kit! I see so many families WITHOUT one these days, and having to go hunting and asking for help from others. SO important to be prepared for anything!! !